How do Auto-darkening Welding Helmets Work? Can Auto-darkening Welding Helmets Damage Eyes? When used with proper care and caution, auto-darkening helmets do not damage eyes. Make sure the batteries in the helmet are fully charged and the helmet sits well on your face. Also, adjust the settings of the helmet as per the welding job and your comfort level. The helmet is designed with several layers of lenses placed upon each other. The UV/IR Filter, the polarization filter and the LC (Liquid Crystal) cells that prevent the eyes from harmful effects of the arc light. The helmets are designed in a way that even when the auto-darkening lens is switched off, the harmful UV/IR rays are blocked by the filters that are in place. 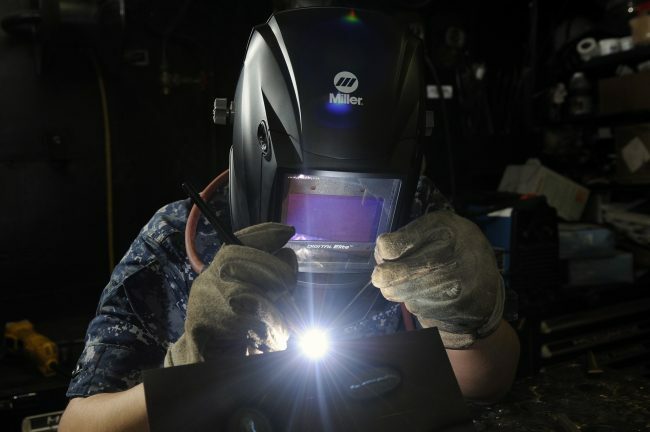 In the case of lens failure, the helmet will alert the user who should then stop the welding immediately. If the battery of the helmet is low, the user will also get an alert to change the batteries. Auto-darkening helmets, as the name suggests, darken as soon as they detect the bright flare of the arc. The benefit of these helmets is that the welder doesn’t need to get the helmet in place and put it over his eyes before starting to weld. Auto darkening helmets use a variety of photosensitive lenses that block out the harmful rays coming from the arc and protect the user’s eyes. These helmets can be set up to work with different kinds of welding processes and the darkness of the viewing surface can also be adjusted as per the welding requirements. Here are the steps you should follow to adjust an auto-darkening welding helmet before using it. Place the helmet on a flat surface and lift the front of the helmet to check the battery and make sure it is fit in the right slot and it won’t fall out if the helmet is jolted during regular usage. Choose the shield delay time that you are comfortable with. This time refers to the time that the shield will take to change from a dark to a light state. There is a switch inside the helmet that can be used to adjust the shield delay time. You can adjust the shield delay to quick or slow depending on the type of welding work you are planning to do. Check your helmet model for the knob on the left side of the helmet that is used for adjusting the shade setting. The knob allows the wearer to adjust the intensity of the shade according to the nature of the welding job. Once the shade is adjusted properly, make sure you wear the helmet and check if the shade is as per your comfort level. Adjust the angle of the helmet so that you can see through the shield with ease. If the helmet is setup properly, the shield will darken even when you are not looking at the arc. 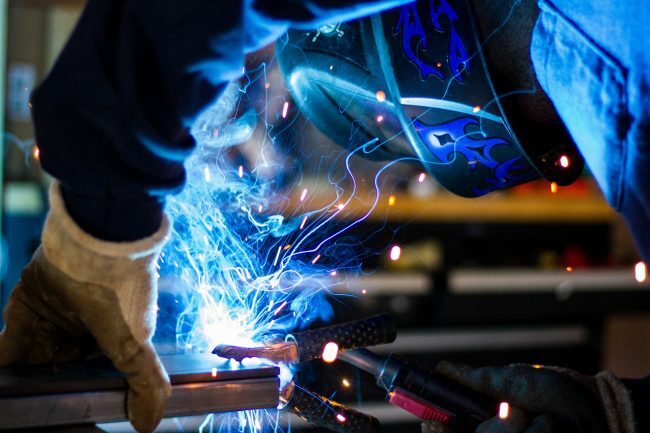 Welding helmets are designed with safety in mind, but when it comes to industrial work like welding, you can never be too safe, and it is always wise to follow safety guidelines and common sense while working on any kind of welding project. Here are some of the guidelines you can keep in mind when using an auto-darkening welding helmet. Always check the helmet and the filter lens to make sure they are clean and there are no cracks or any other kind of damage on the unit that you are going to use. Wear the helmet properly and fix it on your head so that it’s snug and comfortable. The fit of the helmet should facilitate neck movement in all directions without causing discomfort. Ensure that you are wearing safety goggles under the lens and you are also wearing protective clothing to prevent your skin from radiation or burns from the arc. Work in a clean space that is away from other welders to prevent any accidental exposure to arc rays from other welders in your vicinity. Auto-darkening helmets offer a greater degree of protection as compared to regular welding helmets. These helmets also reduce the chance of accidental exposure to arc light during welding as they can darken their screen in a fraction of a second. Most of all, the helmets are designed to be used in all kinds of settings where welding is needed and they have a range of failsafe options as well. When the battery of the helmet is low, it alerts the user to replace the battery before starting work. To sum up, the auto-darkening helmets will not damage your vision as long as these are used safely and with a sense of responsibility towards yourself as well as your colleagues in the welding area. If you have any questions or queries about auto-darkening welding helmets, please feel free to leave a comment, and our team will get back to you at the earliest.